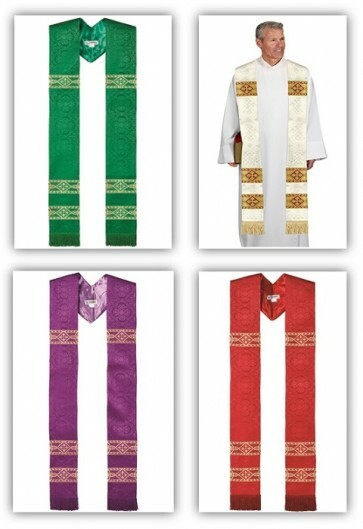 R.J. Toomey Avignon Collection set of four overlay stoles (green, ivory, purple, red) with 2" custom-dyed fringe have floral damask pattern and three gold metallic jacquard bands symbolizing the Holy Trinity. Back cord keeps stole comfortably in place. Polyester jacquard fabric with satin backing resists wrinkling, and is tailored for a beautiful drape. Compare the design, tailoring and careful attention to detail of R.J. Toomey vestments to other brands - you won't find a better value! Save when you buy the set!